With just a few craft supplies and household items that you probably already have on hand, your kids can create useful and decorative items to celebrate Independence Day. Each of these projects promises easy — and affordable — 4th of July fun for the whole family! Kids can easily decorate plain tote bags with acrylic paint and stamps. To add an extra personal touch, make stamps out of potatoes! To make the potato stamps, an adult can carve simple shapes such as stars and stripes into the cut side of halved potatoes. Then, the children can stamp their patriotic designs onto the bags using acrylic paint. Use these homemade eco-friendly totes to carry toys and food to the beach or to watch the fireworks on Independence Day! Keep sodas cool with personalized drink koozies. Purchase thin foam sheets from the craft store in red, white, and blue. Cut one piece into a rectangle and wrap it around a soda can — overlapping the ends a bit. Mark the place off with a pencil, remove the rectangle, and glue the ends together to form the cozy. Then, cut out stars, stripes, or letters from the remaining foam sheets and glue them on too. Make one for each child and even for the adults to keep drinks from getting mixed up. You can make this project even easier by using actual foam drink cozies and decorating them with fun things like cutouts and glitter. Or, you can use old socks or sleeves from shirts & sweaters to make fabric koozies. Do you have any leftover star garland from Christmas or birthday gifts? Simply wrap the garland repeatedly around the end of a dowel or small stick, and secure with a little tape. In just a few minutes, you have safe sparklers for kids that will last far beyond the Fourth of July! Place cardboard, layered newspapers, or wax paper inside a clean and dry t-shirt to keep paint from bleeding through to the other side. Smooth out the shirt. Then, use fabric paints to decorate the shirt. Fireworks make an easy but festive design. Simply draw asterisks with different colors of paint to get that starburst effect. Allow the paint to dry overnight and enjoy your new DIY Fourth of July shirts! String pony beads in red, white and blue colors. Halfway along the desired length of the necklace, string a glow stick. (Be sure to purchase glow sticks that have a hole for hanging on one end.) Finish stringing the rest of the beads and tie the ends in a sturdy knot. Make sure the necklace is long enough to slip easily over the child’s head. Then, while watching the fireworks, crack the glow sticks and watch everyone’s face light up! Use scissors to curl red, white, and blue ribbons of varying lengths, and tie one end of the bunch in a knot. Sandwich the knotted end between 2 stars cut out of sturdy paper or foam sheets with a little glue in between. Tie or tape the streamers to the handlebar ends so they fly freely when cruising down the street. Use regular white glue to draw fireworks and starburst-style shapes on black construction paper. Before the glue dries, sprinkle glitter over the glue drawings and gently slide or shake off the excess into a container for reuse. (To skip a step, you could simply use glitter puffy paint for a similar effect.) Allow the picture to dry and hang it up to be admired! Add the words “Welcome” or “Happy Fourth of July” to create a festive sign for the front door or to hang on the backyard fence if you’re having an outdoor party. Another fun idea: use sidewalk chalk to draw fireworks on the pavement! Wreaths add flair to every holiday. This 4th of July wreath calls for a paper plate, star cutouts in paper or foam, glue, scissors, a pencil, and a cup or other round item to use as a guide. In the center of the paper plate, place the cup and trace around it. Then, cut out the center carefully, leaving a donut shape. Discard the center piece. Cover the remaining circle with stars, overlapping them to cover all of the plate. Once the glue dries, attach a ribbon to the back with tape or glue to hang the wreath. Cut empty paper towel tubes (or pieces of PVC) into rings about 2 inches wide. Then, paint them in red, white, and blue stripes for a very inexpensive Independence Day craft. After they dry completely, add stickers or glitter to personalize them. Finally, slip napkins into the rings as the final touch to a great Fourth of July table setting that the kids helped create. For simple designs — like small stars, USA, and bursts of fireworks — kids can probably paint them on their friends’ faces, with a little guidance. 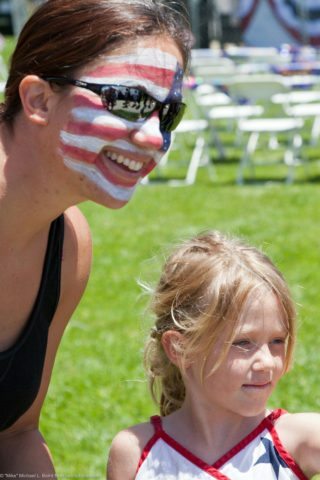 For more sophisticated Fourth of July face painting designs, adults will want to take charge of the process. 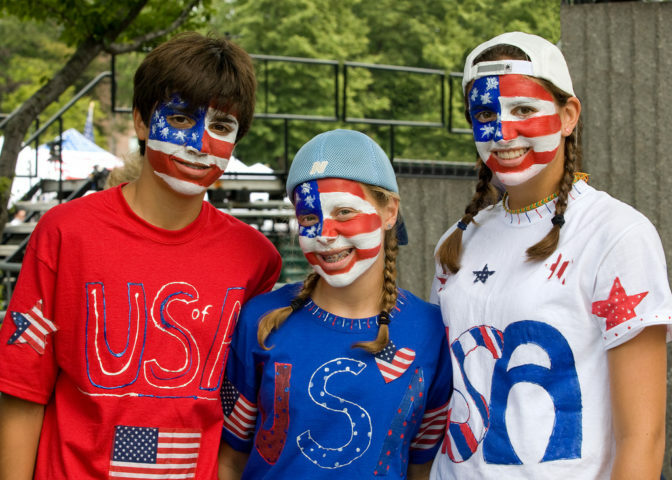 With a little creativity, you can create your own Fouth of July face painting designs from simple to shocking! With a background in elementary school education, Olivia writes on a variety of topics including children’s education and care, holistic health, cooking, literature, science, history, and travel.